Many people use small dumbbells to increase the resistance in their aerobics classes. Attending an aerobics class or taking part in any sort of aerobics workout provides cardiovascular and muscle-toning benefits for your body. A common way to get a little more out of the exercise is to hold a dumbbell in each hand while you work out. The key to doing so is to use moderately weighted dumbbells, as going too big can cause injuries. Dumbbells aren't conducive to all types of aerobics workouts; you'd look a little silly trying to hold them while cycling or swimming. But dumbbells pair well with such aerobic activities as jogging, jumping jacks, in-line skating, stair climbing and step aerobics class. 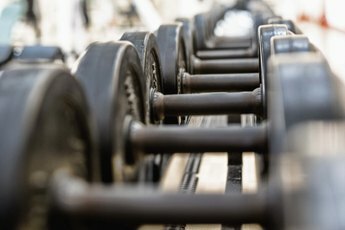 When selecting dumbbells for your activity, remember that bigger isn't necessarily better. The American Council on Exercises recommends using dumbbells that weigh between one and three pounds. Even these small weights can help you tone your muscles during aerobic activity. According to ACE, dumbbells in this weight range will result in an increase in your heart rate of up to 10 beats a minute and up to 15 percent more oxygen consumption than without the weights. If you're new to this type of exercise, start with one-pound weights to get used to the feeling. 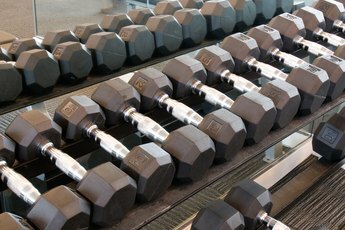 ACE warns that using dumbbells during aerobic activities has potential risks. Because you're gripping the dumbbells tightly, it's possible to elevate your blood pressure considerably, which is dangerous if you have heart problems. ACE recommends avoiding weights that exceed three pounds because heavier weights can potentially damage the muscles and joints in your arms and shoulders. You don't necessarily need to use dumbbells to increase the resistance during your aerobic activities. Alternatives such as weighted gloves and wrist weights provide the same benefits, but allow you to use your hands, which is ideal for sports such as cycling and swimming. Wrist weights are especially common at gyms, and along with weighted gloves are readily available at many fitness stores. As with dumbbells, adhere to the one- to three-pound guidelines cited by ACE. Does Weightlifting Burn More Calories Than Aerobic Exercise?